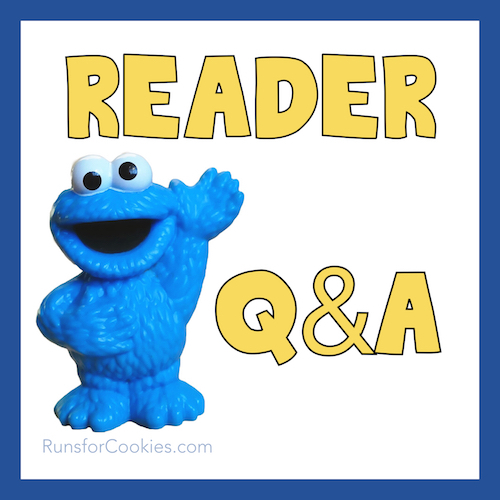 It's been a few weeks since I've done a Q&A post! Q. Did you have to re-size your wedding ring after losing weight? A. My engagement/wedding rings have actually been the same size since we bought them in 2002! That's not to say they didn't NEED to be re-sized, however ;) When Jerry and I first got engaged, I was about 180 pounds (after a short bout of dieting). I have no idea what size my ring is--I think 7.5? My weight went up and down, and sometime during my pregnancy with Noah (2003-2004), the rings stopped being able to slide off. I remember being in the hospital, and the nurse asked me to take off my rings because she was going to insert an IV and my hand might swell a little. I couldn't get it off! After that, my rings were actually stuck on my finger from 2004 until after I lost quite a bit of weight--I believe it was early 2010 when I was finally able to get the rings off. That was a big NSV (non-scale victory) for me. Now, the rings actually fit pretty good. I've always had big fingers, and they didn't shrink a whole lot when I lost the weight. The rings can come off easily, even on my puffiest days, but they never fall off. Q. After you finished your weight loss, how many calories did you (and do you now) eat? Did you ever feel deprived because of the restricted diet while losing weight, and if so did it lead to binges after your weight loss? I reached my weight loss goal, but having been feeling deprived of food and I find myself eating a lot, and then realize I gained weight and then go back to calorie counting to loose it. This has been going on for a month. I just feel like it is an never ending battle, and am trying to find some kind of balance. Any advice? A. I didn't have a smooth transition from weight loss to maintenance, like I'd hoped. I was just 10 pounds from my goal when I fainted and severely broke my jaw--I had to have two surgeries, resulting in my jaws being wired shut (and a liquid diet). I lost the last 10 pounds while I was recovering, and because of the liquid diet, I wasn't counting calories anymore. As soon as the wires came off, and I could eat solid food again, I ate a LOT to make up for the deprivation, and the 10 pounds came back right away. I never really picked up counting calories again for more than a few days at a time. I've tried numerous times to get back to counting strictly so that I can get back down to my goal weight, but I never last very long. And quite honestly, I'd be happy to stay right where I am if it means I don't ever have to count calories again! But I'm always trying, because I'm afraid that I will just go up and up and up if I don't. So to answer your questions, I wasn't counting calories when I hit maintenance, so I can't tell you exactly how many I was eating. But I had formed so many healthier habits while I was losing weight, and I continued those habits after I hit maintenance, which is how I've managed to keep the weight off. Ice cream at a farm with the family? Sure! feeling lonely? Nah, I shouldn't. I think it's important to find a balance you can be happy with--you don't want to feel very deprived, but you can't go back to your old habits, either. The way I live now, I don't feel deprived very often, but I certainly do have to make sacrifices! I post often about junk that I eat, so it might seem like I give in whenever I want something. But the truth is, if I ate ice cream every time I had a craving, I would be 253 pounds again for sure. Sometimes I allow myself to have it, and sometimes I don't--so I don't feel deprived in the sense that I DO still eat ice cream; I just wish I could eat it for three meals a day ;) Am I making sense? What I would suggest is eating foods that you really, truly love--then you won't feel deprived. You can count calories and plan to have a special snack or treat every day that you really enjoy. I did that throughout my entire weight loss, which is why I didn't feel deprived (most of the time; like I said, sometimes you have to say no to things you really want, and that's okay too). My binge eating definitely stems from emotional eating rather than deprivation, which is an entirely different issue. But if you think you're binge eating because of deprivation, then the solution would be to stop depriving yourself--just make sure you plan for it so it's not impulsive. Fall is my favorite season!!! I love the crisp air and everything pumpkin as well. I also love picking apples and making crock pot apple sauce. "Ice cream at a farm with the family? Sure! Ice cream on the couch by myself when I'm feeling lonely? Nah, I shouldn't." Oh, this is a really good thought - I can definitely use this! Thanks for putting it in my head! I agree! Now we just need someone to make a cute ecard out of it!! I'm looking forward to soup and chili! I enjoy your blog and read it every single day. I have been on a weight loss journey since 2009. I've been close to my goal weight several times and then gain 10 lbs again. I began running last August and ran a 5k in October. I am training for my first 8k now. Thanks for being so open and honest in your blog. I'm looking forward to fall weather, possibly a new (smaller) pair of jeans since I've been running, & Halloween! I'm already in full Fall swing baby! Oatmeal cookies, pumpkin anything, chili and if I didn't sweat to death I'd have on a comfy sweatshirt and fuzzy socks. I'm praying for a cool snap soon so I can really get in the mood! I'm ready to be able to workout outside during the day! Today was the first sub-90s day we have had since May...it was awesome! I did 10 miles on the bike in the morning and a 5 mile walk this evening. I can't wait for the 70s! Hopefully I will be able to fit into my smaller jeans soon! Yep, fall is my favorite season, for the same reasons. :D That pumpkin smoothie looks so-o-o-o-o good! Thanks for the recipe. 1) What protein powders do you use? 2) What kind of blender do you use? I'd like to make protein shakes and fruit/veggie smoothies, but have read dicey reviews of both affordable and super expensive blenders. I keep losing weight and now my jeans are so loose. See? Omgosh! If it wasn't midnight I would be making that smoothie rightnow! Thx for sharing another great recipe! For Fall, I am most looking forward to getting as much outdoor activity in as possible, before you know what comes...!!! I am so ready for fall - I love it! I love sweaters! But being in the south, it will probably still be a while before I can bring them out. I am looking forward to getting outdoors. Its been so hot I havent been able to go outside. But with the cool crisp air I am looking forward to exercising. I made the vegan pumpkin pie smoothie the other day and it was SOOOO GOOD. I love fall! I love being outside during the fall months and the cooking/baking with all the pumpkin ingredients. I love that you differentiated when it was appropriate to give in to a craving or treat yourself. I never thought about it that way before. It gives treats a whole new meaning. Aha moment! Thank you! Loved how you explained the difference between bingeing and having an occasional treat. I am very very hungry right now, but I'm trying to do my best not to give in to that urge to snack uncontrollably. Wish me luck! I too have been unable to go back to tracking my food. I even downloaded the fitness pal app on my new iPhone, and I'll track food for a day or two and then quit. Sometimes I add up calories in my head. My goal is around 1,500, but I think I'm going over that most days. My other goal is to drop about 10 pounds, that is probably not going to happen unless I can drop below 1,500 calories per day. I have come to the conclusion that you can't eat much and weight less than 150 lbs! It's like you say--it would be okay if I could just stay here forever, but I can see the scale inching upwards. That's just scary! Also enjoyed your wedding ring saga. I had my rings made bigger probably 20-25 years ago, or was it 30? A LONG time ago! They had to be cut off my finger at the time. So during my weight loss I got to the point where the rings would literally fly off my finger, and I took to wearing them on my middle finger so I wouldn't lose them. FINALLY....just after Christmas last year (more than 6 months after I hit my goal weight), I went to the jewelry store and got them re-sized. I went to the same jeweller, and I asked if they would engrave it, since the letters had become obscured when it was made larger. She said, "Did you buy the rings here?" I said, "Yes, 41 years ago." But they engraved it for free, and I had them put exactly what hubby had them engrave all those years ago, "I need you." At first I thought that was a little strange, but I grew to love it over the years. We certainly do depend upon each other! Mmmm! That smoothie looks amazing! I hate fall (I miss summer too much) but I do love all the spiced comfort foods! I am looking forward to running outside and MAYBE not sweating as much!